The Yamaha YDP-144 Digital Piano brings the legendary Yamaha CFX sound engine and upgraded speaker system brought to the Arius range. Now you can have the most stunningly accurate recreation of a Yamaha concert grand in any room of your home. Complete with an incredibly authentic keyboard, premium quality piano has never been so affordable. The YDP-144 utilises Yamaha's 88-note Graded Hammer Standard (GHS) keyboard. This gives you a slightly larger weight in the lower register and gradually gets lighter toward the higher notes, just as you would find on a grand piano. The black key tops have also been finished in a "matte" coating making for easier grace notes and improving comfort over longer performances. 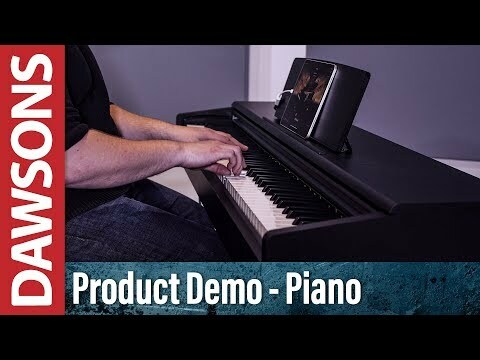 Complete with a grand-feel 3-pedal system, the Yamaha YDP-144 gives you damper, sostenuto and soft control just as you would find on a grand piano. The pedals even support "half-pedalling" to help emphasise heavy string whilst keeping the upper register damped. Yamaha are masters of grand piano production which has given them a powerful advantage when creating their range of digital pianos. The sound of the renowned Yamaha CFX concert grand piano has been painstakingly sampled to give you a rich and expressive tone anywhere you need it. The CFX engine translates every dynamic of your playing with astounding accuracy, so much so that even the most traditional of acoustic players will be thoroughly impressed. As well as the built-in grand piano, there are a total of 10 premium quality sounds that can help you deliver incredible performances. The YDP-144 also allows for split and layer modes so you can combine the internal sounds however you wish, maximising performance repertoire. The Yamaha YDP-144 Digital Piano includes an easy to use 2 track sequencer that is an exceptional tool for capturing performances or as a practice aid. Combine different voices and overlay passages to make your own compositions. All recordings are made in a standard MIDI format and as such can be stored on a computer via the built-in USB port. However, the real jewel of the crown here is Yamaha's Smart Pianist app for iPad. Have you ever tried to figure out what the chords are to your favourite songs? The Smart Pianist app can analyse audio from any song of your choice and displays all the chord symbols for you. This makes it possible for you to play along and improvise with virtually any song available today. Smart Pianist also makes it possible to control deeper functions within the YDP-144 and also lets you change sounds at a swipe of the screen. The YDP-144 Arius Digital Piano is such a versatile instrument. Beginners or professionals will both be impressed by its capability. Compact enough for the home yet powerful enough to be used in venues, the YDP-144 really does have it all.